Android devices are the kind of portable media centers and they allow you to view the photos and videos, listen to the music while on the go. Some times you want to enjoy these things on the larger screen then you need to use PlayStation which can read these files through the USB connection and display them on Television. So, here is the procedure for how to transfer data from Android device to PS3. To do this all you need is a Allshare app. 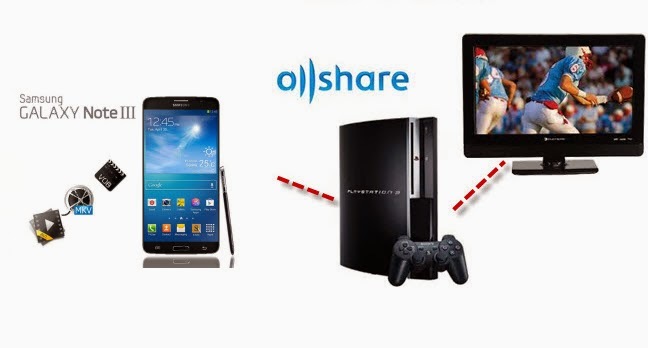 It connects your Android phone or tablet to PS3 wireless and lets you to share your media files to PS3 for streaming. First you need to download the AllShare tool from Samsung website or from Google Play Store. Now connect your Android Phone to WLAN. Open the Allshare application on your device. Tap on the menu button and go to the settings. You can name the device as what you want. Do enable share picture, share video and share audio to share your files. Select the default memory which you want to share. On your PlayStation 3 select the name you created on Allshare app as the media server. On your Android device select the PlayStation 3 as the media player. You can control the playback like forward and backward on the both the PlayStation and Android device. Now enjoy the transfer of data from the Android device to PlayStation 3 and enjoy the media streaming on the large screen.